GFA-supported Sisters of Compassion frequently minister to those who suffer from leprosy’s disfiguring and damaging effects. 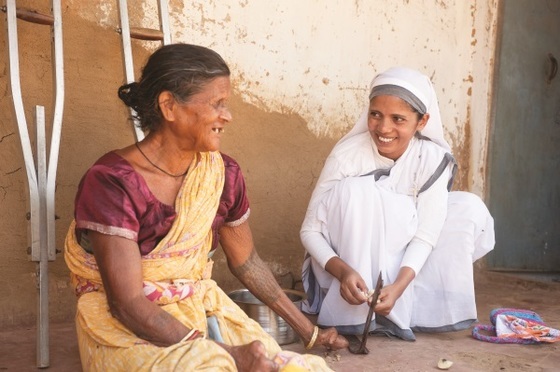 The woman pictured lost her leg due to the disease, and the Sisters of Compassion frequently help with her chores, visit her and bring joy to her life. She had only been married a few days. What should have been one of the best times of her life was suddenly marred by a strange condition in her leg. Yoshita, only 25, had contracted leprosy. Yoshita and her husband came from a poor community in an area where leprosy is not uncommon. Most people in her village worked hard as farmers or daily laborers, straining their bodies for an entire day in the hopes of earning enough for one meal ... but their wages also had to satisfy the people’s common addictions to alcohol and drugs. Yoshita labored hard among her neighbors, but sometimes she could only beg along the side of the road. 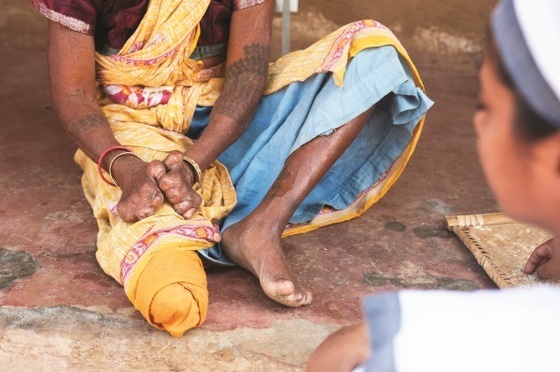 When leprosy attacked her leg, hopelessness settled into her heart. She visited doctor after doctor, but they weren’t able to mend her suffering. She turned to local practitioners of traditional medicines, but nothing improved. As the years passed, her pain increased, and her mental agony grew. All hopes of finding a cure were shattered, and she found herself in a hospital. Ten years had passed since her wedding, and Yoshita had little to show for it but a missing leg and a hurting heart. But as Yoshita lay in the mission hospital where her husband had admitted her, she heard something quite unexpected: songs of praise. A group of GFA-supported Sisters of Compassion had come to the hospital. They made their way through the rooms, visiting with and praying for those who were ill, singing songs and reading encouraging Scriptures to lighten burdened hearts. When these sisters prayed for her, Yoshita noticed a difference in her body, but beyond the physical relief she experienced was the emotional freedom she felt as God lifted the agonizing weight of crushed dreams from her heart. As she talked with the Sisters of Compassion, Yoshita learned about the Author of hope and decided to turn her heart over to Him for safekeeping. GFA-supported Compassion Services workers, like Sisters of Compassion, serve amid the suffering. They minister in places like leprosy colonies, hospitals and slums, and they help people after natural disasters, aiming to bring the peace of Christ to those who have no hope. Through your prayers and support of the ministry of GFA, you have been part of blessing countless men and women, like Yoshita. God touched her in her hour of need, and her broken heart has been restored.